A cool baptismal invitation card that comes with a green dark envelope, which is combined with a white invitation card that has painted a pineapple in bright colors. The wording of the baptism is printed in the same bright colors on a white background. 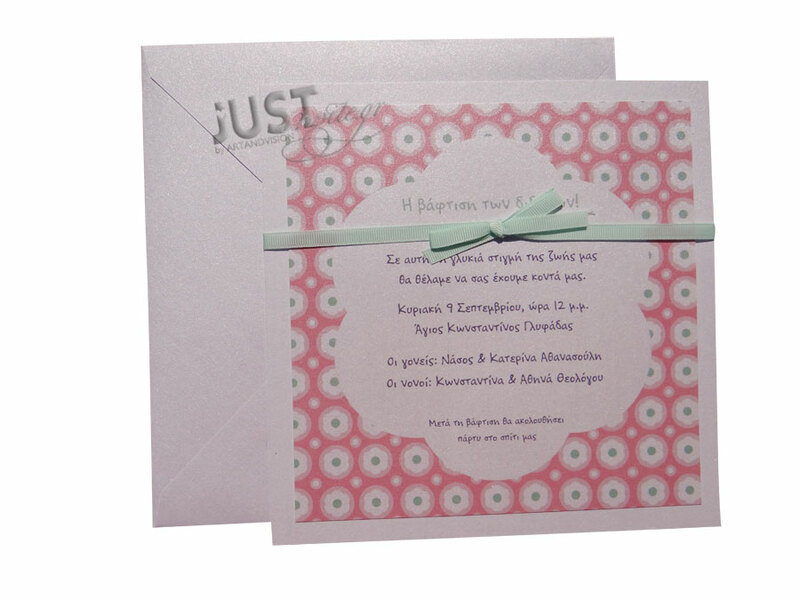 https://www.preciousandpretty.com/2017/04/romantic-christening-invitations-for-baby-twins-C1121.html Greek Wedding Favors|Orthodox Crowns|Stefana|Baptism Invitations Romantic Christening invitations for baby twins C1121 Greek Christening invitations in romantic style for twins. Product #: Greek Wedding Favors|Orthodox Crowns|Stefana|Baptism Invitations_2035336060138387408 5 stars out of 5 reviews.